Looking for a satisfying dinner that has it all? 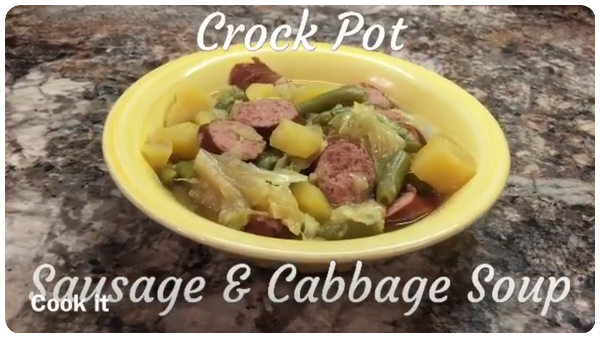 Pair this with biscuits or dinner rolls and call it a day! Add Chicken Broth/Stock to crock pot and set on high. Peel and cube Potatoes, rinse and add to broth. Chop Onion and add to broth. Add Bouillon Cube and stir. Slice Smoked Sausage into bite size pieces, add to broth and stir. Cut Cabbage into 8ths, remove core. Break up wedges and add to broth and stir to tuck Cabbage in as much as possible. Cover and cook 3-4 hours or until veggies are tender. Add Salt and Pepper to taste and stir. Add Green Beans and stir well. Cook for an additional 10 minutes and serve.